The 3M 8812 has a convex cup-shape design, along with twin strap design, nose foam and nose clip to make for easier breathing. Comfortable design that is suitable for many different face sizes. The elasticated head bands ensure a secure fit. 3M Cool Flow valve reduces heat build up and, with the collapse resistant shell, this offers durable comfortable protection. Performs well in hot and humid conditions. Provides exceptional protection against dust and mist. Conforms to EN 149:2001 Safety Standard. The 3M 8710E respirator offers lightweight, effective, comfortable and hygienic respiratory protection against dusts. The convex shape, twin strap design, foam nose seal and aluminium nose clip give an excellent face seal over a wide range of face sizes. Used in a variety of industries such as pharmaceuticals, agrochemicals, construction, pottery/ceramics and labs. 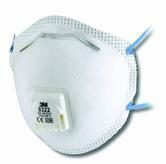 3M 8710 FFP1 Unvalved Respiratory Mask conforms to EN 149:2001 Safety Standard. 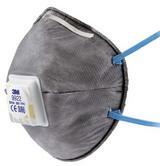 Pack of 20 3M 8710 FFP1 Disposable Dust Masks. 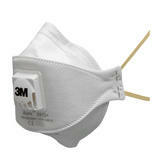 The 3M 8835 FFP3D disposable mask is for protection against fine dusts, metal fumes and oil and water based mist. Soft face seal for additional comfort. Exhalation valve to prevent heat and moisture build-up. Can be used for more than one shift due to optional Dolomite test and cleanable face seal. 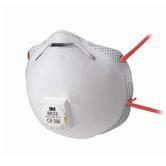 3M 8835 FFP3D Valved Respiratory Mask conforms to EN 149:2001 Safety Standard. Pack of 5 3M 8835 FFP3D Valved Respiratory Masks. The 3M 9913 nuisance odour dust mask is designed to offer relief from the irritation of low levels of specific gases and vapours. This breathing mask offers relief from nuisance levels of organic vapours. Respiratory protection against low levels of fine dusts and mists. Yellow colour coded straps denote FFP1 protection level. 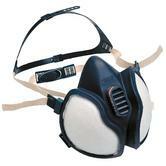 3M 9913 Nuisance Odour Respirator FFP1 Mask conforms to: EN 149:2001 Safety Standard. Comfortable low breathing resistance filter technology for easier breathing. 3-panel design that provides greater facial movement during speech. An embossed top panel to reduce fogging of eye-wear. Unique chin tab - ease of donning and adjustment of the respirator on the face. Supplied in hygienic packaging which help protect the respirator from outside contamination, also allows practical storage and easy dispensing after use in the workplace. 3M 9332+ FFP3 Aura Valved Disposable Respirator conforms to EN149:2001 Safety Standards. 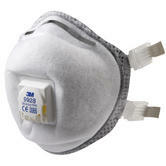 Pack of 10 3M 9332+ Aura Disposable Dust Masks. Comfortable filter technology for easier breathing. Provides superior protection against fine dust, oil, water based mists and other particles. Flexible design allows the mask to fit all face sizes. Elasticated head bands ensure a secure fit. The innovative chinstrap allows the user to make adjustments with ease. The 3M cool Valves installed reduce the build up of heat improving user comfort. Shipped in hygienic packaging to prevent the risk of any product contamination. 3M Valved Respiratory Mask 9312+ conforms to: EN149:2001+A1:2009 FFP1 NR D standards. 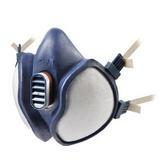 Pack of 10 3M 9312+ Disposable Dust Masks. A Half-mask respirator FFABEK1P3D, with Protection against organic vapours with BP > 65ºC , inorganic vapours, acid gases, ammonia and water and oil based particulates. Ready-to-use, maintenance-free half mask designed for effective and comfortable FFABEK1P3R D protection against organic vapour, inorganic, acid gas, ammonia and particulate hazards. Maximum use limitation for organic vapours 10 x WEL or 1000 ppm and maintenance-free design for simplicity and maximum safety. Whichever is the lower for organic vapours, ammonia, inorganic or acid gases, 20 x WEL for particulates. 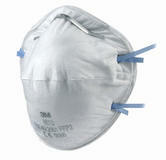 3M 4279 FFABEK1P3D Half Mask Reusable Respirator conforms to: EN 405:2001+A1:2009 safety standards. Manufactured with a soft sealing surface further improving user comfort. With the addition of the cool flow valve the build up of heat is reduced. Heat build up is also decreased by the reduced breathing resistance of the mask. 3M Cool Flow Valve reduces heat build-up to offer workers comfortable protection. Flexible system for gas, vapour and particulate filters. 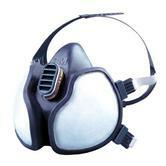 3M Half Face Mask Respirator 7500 conforms to EN140:1998 Safety Standard. Provides against organic vapours with BP > 65°C and water and oil based particulates. Product limitations : 10 x WEL (Workplace Exposure Limits) or 5000ppm, whichever is the lowest for organic vapours and 20 x WEL for particulates. Cleverly designed face seal, provides extra face grip preventing slippage. Products boiling point is at 65°C. Low profile design for better peripheral vision and low resistance parabolic valve to reduce heat build-up. 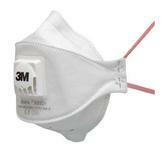 3M 4255 FFA2P3D Half Mask Respirator approved to EN405: 2002 FFA2P3D standard. Protection against organic vapours with BP > 65°C. Maintenance-Free reusable respirator designed for effective and comfortable protection against a combination of many gases, vapours and particulate hazards. Utilizing unique filter technology enables a very low profile design for undisturbed field of vision. 3M 4277 protection against good warning properties, acid gases, water and oil based particulates. Comes with 2 bonded carbon filters - for ease breathing. Built-In filters are integrate to the mould. Requires no spare parts or filters. The low profile enhances your visual range and textured face seal - to provide a comfortable fit. Parabolic exhalation valve gives easier breathing and reduces build up of heat. 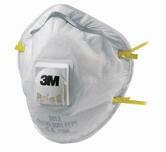 3M Half Mask Respirator 4277 FFABE1P3D conforms to EN405:2001 Safety Standards. An air-supplied helmet that provides respiratory, eye, face and head protection when suitably connected to an AS/NZS1716 compliant air supply system. Fully-adjustable suspension that includes textile straps for optimal fit and weight distribution. Multiple size adjustment options - allows for a comfortable fit. Air deflector - allows users to direct the airflow down or into the face for increased control and comfort. Visor design - combines excellent peripheral and downward vision with good optical clarity. 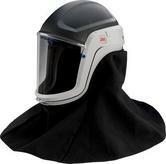 Coated polycarbonate visor - provides added chemical and scratch resistance and high impact protection. 3M Versaflo M-406 Respiratory Protective Helmet With Visor conforms to (when connected to air supply system): EN 12941, EN 397, EN 14594., EN 166 safety standards. 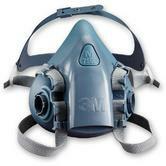 Full face respirator from 3M, with a large lens offering a wide field of vision. Double face sealing gasket ensures a good fit for different face sizes. The soft, pliable hypo-allergenic material keeps the wearer comfortable, while filters and an air supply can be easily managed. This is a low maintenance, lightweight & well balanced respirator. 3M 7907 Silicone Full Face Respirator conforms to EN 136 Class 2 for protection during more aggressive tasks. The newly added exhalation port improves durability and lowers the build up of heat. This respirator is easy to setup and maintain. Manufactured with a wide view polycarbonate lens. Its lightweight and silicone seal provides a secure, comfortable fit. Centre adapter directs exhaled breath downward and the 3M Cool Flow Valve makes breathing easier. Compatible with a broad range of filters. For use with 3M Cartridges 6000 Series (3M Filters 2000, 2200, 7000 or 5000 Series) or 3M Dual Airline Systems against a variety of gases, vapours and particulate hazards according to NIOSH approvals. 3M Full Facepiece 6000 Series Reusable Respirator conforms to EN 136:1998 (Class 1) Safety Standard. Provides exceptional protection against Gasses, vapour and fine particles. Compatible with 3M 6000 & 7907 Series Half Face and Full Face Masks. The unique shape allows for perfect unobstructed vision. 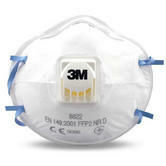 3M 6099 A2B2E2K2P3 Respirator mask filters conforms to EN14387:2004 + A1:2008 Safety Standard. Supplied in a pack of 2 Cartridges. 3M Respiratory Protection: face masks, half masks and full face respirators. 3M Disposable respirators or face masks are the most widely used. 3M is the market leader - selling more face masks in the Uk than any other supplier. 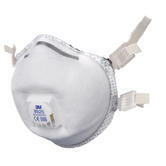 3M 8835 face mask or respirator is the most popular. But whether you choose Valved (comfort) or Unvalved (cheaper), always be sure that you meeting the required protection level, as denoted by FFp1 or FFp2 etc. Please use our Respiratory Buyers Guide to help select the correct face masks. We stock a full range (with same day dispatch) of 3M Reusable Half Masks and the requisite Vapour filters and Particulate filters, by 3M.